(Nanowerk News) Two photons in free space do not interact. Light waves can pass through each other without having any influence on each other at all. For many applications in quantum technology, however, interaction between photons is crucial. It is an indispensable prerequisite for transmitting information through tap-proof quantum channels or for building optical logic gates. 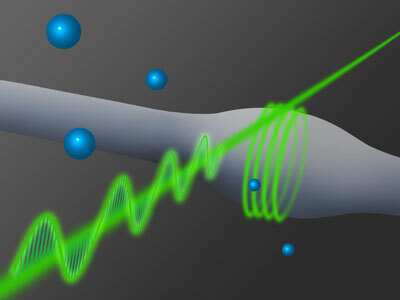 At the Vienna University of Technology (TU Wien), scientists have now succeeded in establishing a strong interaction between two single photons. 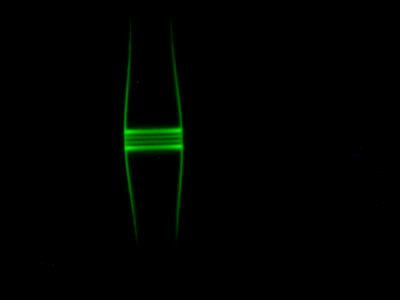 This opens up completely new possibilities for quantum optics. The experimental results have now been published in the journal Nature Photonics ("Nonlinear π phase shift for single fibre-guided photons interacting with a single resonator-enhanced atom"). "In order to have light interact with light, people have been using so-called nonlinear media", says Professor Arno Rauschenbeutel (Institute for Atomic and Subatomic Physics, TU Wien). The light has an effect on the properties of these materials, and the material in turn influences the light, which leads to an indirect coupling between photons. This technique, however, can only be used at strong light intensities, when countless photons are involved. At TU Wien, a system was built which creates a strong interaction between only two photons. This interaction is so strong that the phase of the photons is changed by 180 degrees. "It is like a pendulum, which should actually swing to the left, but due to coupling with a second pendulum, it swings to the right. There cannot be a more extreme change in the pendulum's oscillation", says Rauschenbeutel. "We achieve the strongest possible interaction with the smallest possible intensity of light." Things change when two photons arrive at the same time. "The atom is an absorber which can be saturated", says Arno Rauschenbeutel. "A photon is absorbed by the atom for a short while and then released into the resonator. During that time, it cannot absorb any other photons. If two photons arrive simultaneously, only one can be absorbed, while the other can still be phase shifted." "That way, a maximally entangled photon state can be created", says Arno Rauschenbeutel. "Such states are required in all fields of quantum optics – in quantum teleportation, or for light-transistors which could potentially be used for quantum computing."